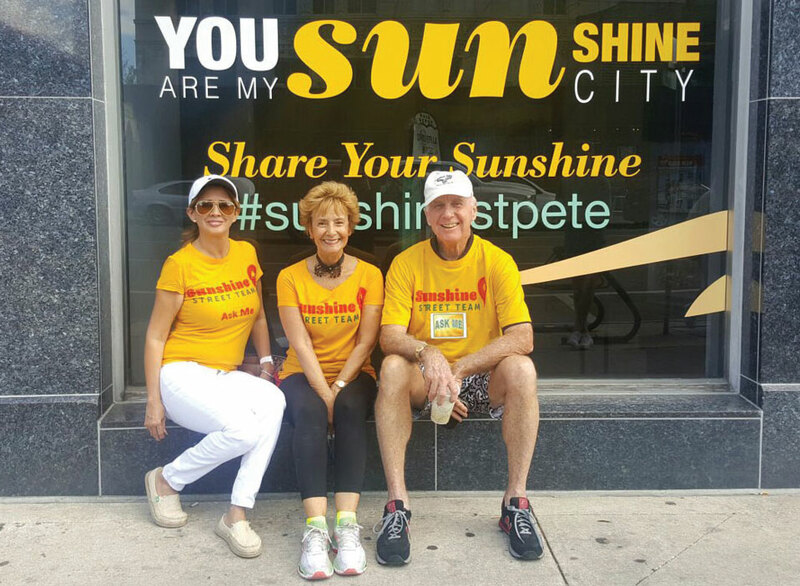 There is a group of citizens who love St. Petersburg so much that they volunteer their time to approach, guide, and assist complete strangers while out strolling their beloved downtown streets. These friendly and knowledgeable residents are part of the Sunshine Street Team (SST), a program that the Downtown Business Association (DBA) launched just this past October. It is quickly growing and proving to be mutually beneficial to the visitors, local businesses, and volunteers alike. 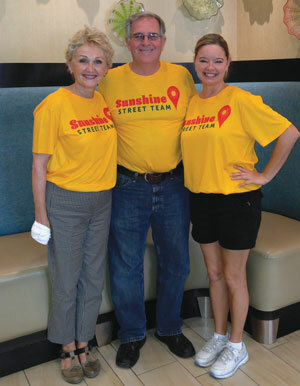 This volunteer program is designed to help everyone have a positive experience while visiting downtown St. Petersburg. Metrics collected from reports focused on the volunteers’ encounters will also help the DBA and the City to understand why people are choosing to come to downtown and what they’re looking to do while here. This vibrant, beautiful city is alive and evolving; you could live here for years and continually discover something new. Whether you’re out to find a great craft cocktail, some live entertainment, a particular type of restaurant, shop, event, museum exhibit, or the best place to park, the Sunshine Street Team may have an even better suggestion than what you had in mind. 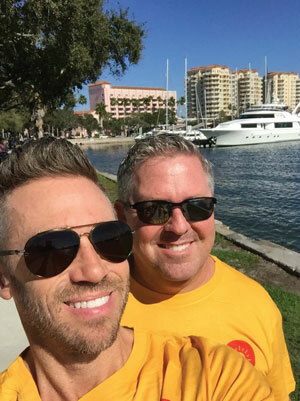 They’re hard to miss in their bright yellow “Ask Me” tee shirts. Even if you just need someone to snap a photo of you and your family, just ask. The idea came about last spring when downtown resident, Terry Watson, told Tami Simms, president of the DBA, that he finds himself stopping to give people information when they look like they need help. Simms quickly pitched the concept of formalizing these altruistic actions to the DBA board of directors, then the membership. They got verbal commitments from sponsors, gathered a committee together, and talked about the goals and the premises and how it might be beneficial. They then drafted a budget and got the program rolling. The team has the support of the City and the Chamber of Commerce and a few sponsors which include Sundial, the DBA, The Simms Team at Coastal Properties Group, Duke Energy, and Cerulean Blu. Additional sponsors, The Museum of Fine Arts (MFA), The Hampton Inn, and the Chamber’s St. Pete Store have also offered themselves as hospitality stops for the volunteers when they need water or to use a restroom. You’ll find volunteers out on Friday through Sunday from 11AM to 3PM from 400 Beach Drive to The Dali Museum, and on Central Avenue to 8th Street, and the streets between 1st Ave N to 1st Ave S.
Currently, there are about 28 volunteers, from late 30s to mid-70s, from full-time workers to retirees. They live all over Pinellas County and come from all different professional backgrounds. Many on the team have been lifelong volunteers for one cause or another. They are self-confident, outgoing, have a passion about the city, and are respectful in their approach. Potential volunteers are assessed for their knowledge of the area and commitment of time, told about the responsibilities, and provided with training and full packets of information. They are to give visitors all the choices without personal preferences. Their mission is to be helpful and to direct folks to places they may not have found otherwise and simply showcase all we have to offer. Some volunteers go out solo, some double up. This fun opportunity is providing volunteers with a way to meet new, interesting people, learn more about themselves, get fit, and feel like they’re part of a team that’s paying it forward. “New friendships are blossoming because of it,” said Fennell-Kennedy. 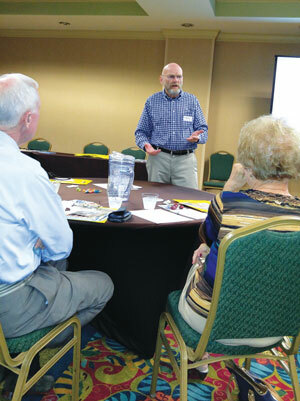 Terry Watson, the St. Pete resident who brought the idea of the Sunshine Street Team to the Downtown Business Association, facilitating a volunteer training. She was out during the Women’s March in January. “We had people of all ages out there, who traveled from all over just for this occasion. It was heartwarming, peaceful, and loving. Our team offered directions to the march, to local restaurants, restrooms, and to The Looper. What an amazing day,” said Rhein. Debbie Binder, a town clerk from West Bloomfield, Illinois, pulled into town with no idea of where to begin. She approached Rhein with a question and learned more about the SST. She loved the concept and spoke about duplicating the service if it could be tweaked to fit her city. 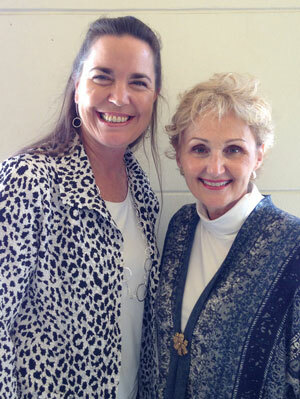 Bailey has been involved with a number of civic and social organizations throughout the years. He is a volunteer and a DBA member who was on the SST launch committee. 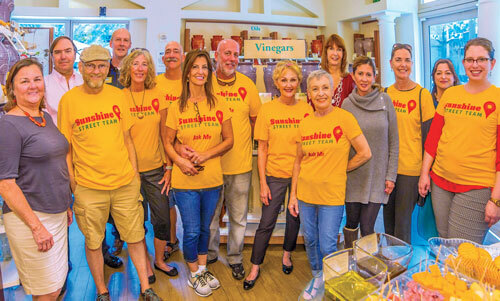 He understands how helpful the Team can be to a business like his, the Savory Spice Shop, which has a 400 Beach Drive address, but a storefront on 4th Avenue North. Always in the know, Rhonda Sanborn, loves being a hospitality ambassador. Sanborn is the former Visit St. Petersburg Clearwater Hospitality Director. She appreciates being out and engaged, meeting the public and business owners, and making sure they know about the team and that they’re out promoting their businesses. DJ and Joe Greco are a husband-and-wife team who have a long history of volunteering here and in NY. These self-proclaimed “sunbirds” live downtown, a block away from Beach Drive. On the Greco’s first day out, they headed to the trolley station and found a young Oregon women’s driver’s license and debit card. Fortunately they also found her business card and wallet nearby. The parties met up at The Oyster Bar. Thrilled to get her things back, especially her ID since she would need it to get on the plane in a few days, Jessica hugged the Grecos like they were long lost relatives. She wasn’t sure if her wallet had been lost or stolen the night before, but the Grecos are pretty sure they convinced her that St. Pete really is a friendly place to visit. VOM FASS hosted an appreciation party. Front: Shelli Hemans, Terry Watson, Dj Greco, Elaine Sherman, Sharon Fennell Kennedy, Willi Rudowsky, Estelia Mesimer, Tami Simms, Julie Chapdelaine (manager at VOM FASS), and Rosie Stovall. Back: Rob Johsnson, Jeff Ritter (owner of VOM FASS), Joe Greco, Alan Sherman, and Susan Robertson. Volunteer Jon Smith has been an Old Northeast resident for a year now. He is a member of MFA and the Zodiac committee at the Dali Museum. A retired physician, he is now enjoying a career change that is full of joyful social encounters working as a real estate agent with Berkshire Hathaway Home Services on Beach Drive. He says providing service to others to help them accomplish their dreams is very humbling and rewarding. “Our business motto is ‘Service First’ and volunteering with SST fits exactly in line with our commitment to the community of St. Pete about providing service to others. Plus walking around downtown, enjoying the fresh air and beautiful landscape, as well as talking to people is just fun.” He hands out a lot of downtown maps, realizing that visual aids are quite useful in helping people find their way around. The SST is working with the hotels and downtown business owners. Hotels advise visitors to look for the folks in bright yellow “Ask Me” shirts, should they have any questions or need assistance, and often the people come back and express their gratitude for the SST. Encounter reports are e-mailed to Fennell-Kennedy after the completion of each shift and shared with all team members so that everyone has a continued sense of what’s going on and a sense of community. Fennell-Kennedy compiles reports into metrics to send to DBA periodically. They are learning that many tourists seem to only be here for one day. From November 18th to the end of December there were over 140 encounters. New volunteers are always welcome. Call Sharon Fennell-Kennedy, at 727-289-2397, email her at mailto:SunshineStreetTeam.org, or visit http://www.SunshineStreetTeam.org.